Namu, founded by brothers Dennis, David, and Daniel Lee, is known for its creative “New Korean American cuisine,” a blend of Korean, Japanese, and local influences. 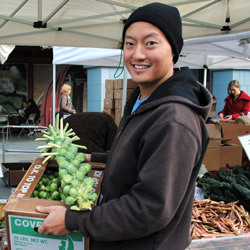 And its operations are as innovative as its menu: Namu is the only restaurant at the Ferry Plaza Farmers Market that operates its own farm, which yields ingredients for the farmers market menu as well as for its Mission-based restaurant, Namu Gaji. “During the summer, 80% of the menu has something from our farm,” says Dennis. The idea for the farm was born out of necessity. When the Lees had trouble tracking down a local, sustainable source for Asian vegetables and herbs, they started looking for ways to grow their own. Initially, Dennis convinced two farmers at County Line Harvest, one of Namu’s regular suppliers, to grow Asian produce for them for a season. Meanwhile, Kristyn Leach, a former cook at Oakland’s Camino Restaurant who was managing a lettuce farm, happened to be growing one of the ingredients Namu was seeking: Korean perilla (also known as shiso). The chef at Camino suggested that she meet with the Lee brothers, who shared her enthusiasm for Asian crops. 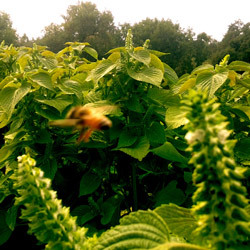 “I had never seen anybody get as excited about perilla as David did. He had a lot of nostalgia about the herb,” she says. The Lees and Kristyn agreed that their common passion was a strong foundation for a farm-to-table collaboration. 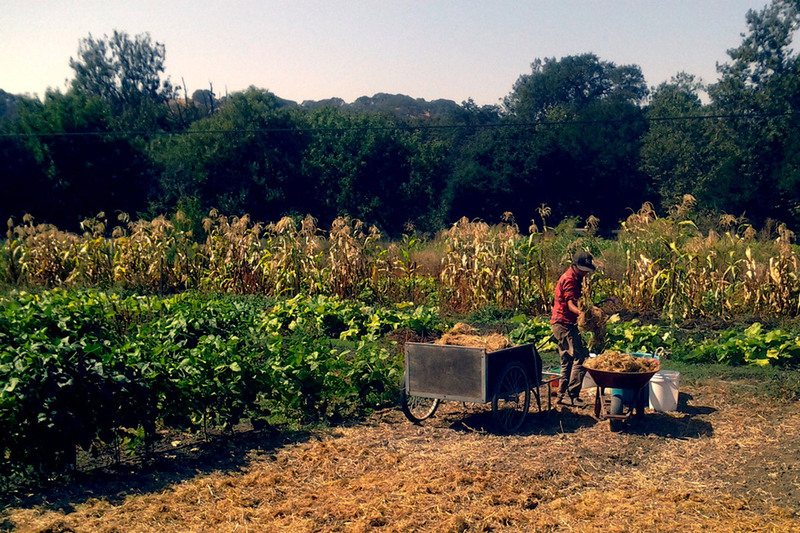 Namu Farm found a home at Sunol Ag Park, 18 acres of farmland in Alameda County managed by Sustainable Agriculture Education (SAGE) in partnership with the San Francisco Public Utilities Commission, with the aim of fostering sustainable farming and public education. When Kristyn approached SAGE, she was hoping to lease a small plot, but was delighted to learn that an acre was available. Dennis makes time in his busy schedule to visit the farm frequently, every week in the summer. “When we first started farming, Dennis suggested growing plants that I had never even heard of,” says Kristyn. Their relationship revolves around brainstorming about crops and cooking, and Kristyn’s understanding of Namu’s cuisine helps her come up with suggestions for ingredients. For example, she grows a miniature Mexican sour gherkin cucumber that looks like a jelly bean because she thought it would be a whimsical addition to a pickle plate on Namu’s menu. Other crops on the farm include Korean melons, Kabocha squash, Dragon’s Tongue beans, and Sansho and Gochu peppers, which add heat to many Korean dishes. Chile peppers were the first vegetables Dennis asked Kristyn to grow. “It’s very difficult to find local, organic chiles,” says Dennis. Kristyn obtains many seeds from the Lee brothers’ mother, who gets them from her hometown in Korea. Other seeds come from Oakland-based Kitazawa Seed Co., the oldest seed company in America specializing in Asian vegetables. “Seeds can be a dangerous addiction,” jokes Kristyn, who delights in experimenting with unusual crops. She grew all of this year’s crops from seeds that she had saved from earlier harvests. For Dennis, it was important that the farm employ sustainable methods, in addition to providing a tangible connection to the land for his family and community. “My approach has always been broader than just being a chef,” explains Dennis. “Food ethics and the food system have always been of interest to me, and even more so now that I am a parent.” He often brings his two daughters to visit the farm with him. Namu Farm combines biodynamic and permaculture practices with techniques based on traditional Korean peasant farming methods. All work is done by hand, so no fossil fuel is used on the farm. Kristyn’s goal is to build healthy soil with twice as much organic matter as required under organic standards. She fosters the growth of indigenous micro-organisms by incorporating mycorrhizal fungus from the woods into the soil. In addition, she allows cover crops to decompose slowly and makes her own kelp fertilizer. Namu Farm reaches out to the larger community by donating produce to the Korean Community Center of the East Bay for victims of domestic violence. Last year, the farm invited the public to participate in a Korean harvest ceremony called Chuseok. 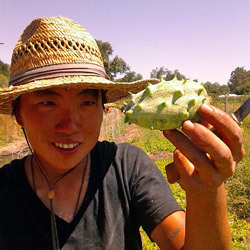 This summer the farm is launching a “chef-driven” CSA that will include produce, prepared products such as kimchee and pickles, and cooking tips from Dennis. Namu can be found at the Ferry Plaza Farmers Market on Saturdays and Thursdays. Farm photos courtesy of Kristyn Leach/Namu Farm.